Allen & Heath’s modular iLive digital mixing system was employed to manage FOH for the recent production of Pete Townshend’s Classic Quadrophenia, taking place at the Royal Albert Hall in London. A classical reworking of The Who’s 1970s album, Quadrophenia, Townshend’s production featured the Royal Philharmonic Orchestra, the London Oriana Choir, and guest singers Billy Idol, Phil Daniels and Alfie Boe. “The brief was to emulate the Quadrophenia studio album, and provide clean, open sound, so I knew I had to choose iLive because it fits the bill exactly – it has a very open, clean sound, great audio processing, is super flexible, networkable, and is customisable so I can make it work for me, rather than the other way round. 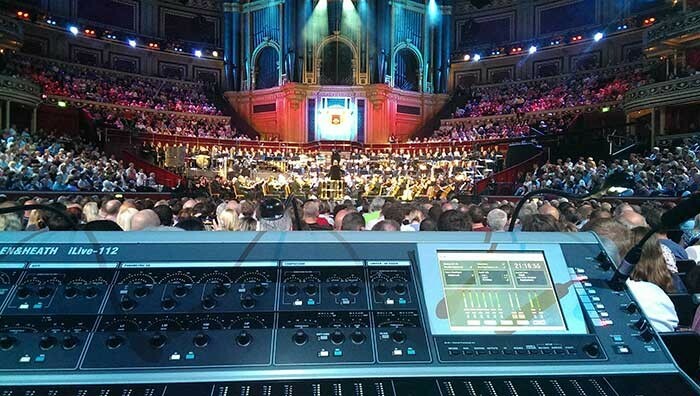 With an 80-strong orchestra, 90-strong choir and various guest celebrity singers, there was a lot going on, so iLive is just what I needed,” explains FOH engineer, Ian Barfoot. The PA was provided by Capital Sound, and the iLive system comprised two modular iDR10 MixRacks installed on stage and linked using ACE, with an iLive-112 control surface at FOH position linked to the racks using fibre optic and cat5 working in tandem. The system needed to manage a total of 128 inputs, with approximately 12 outputs, 16 DCAs, and providing orchestral stems to the monitor board, left and right to the main venue system, and recording feed to the mobile broadcast trucks. “The iLive-112 surface has a compact footprint which is ideal for theatre situations but the impressive thing is that I can run the console as a 224 strip surface, using the soft keys to recall different control strip configurations as scene recalls, greatly expanding the scope of what I see in my layers. By programming various soft keys to provide completely different control strip setups for different parts of the orchestra, I can instantaneously recall a different channel configuration all at the touch of a button. In fact, I could multiply up to nine times the 112 channels – but that’s madness,” says Barfoot! Barfoot also used a laptop running iLive Editor as an extra meter bridge so the system technician could monitor the first 50 microphones, mainly the string section, where most sound reinforcement problems occur. He also used an iPad with the app as a remote control during rehearsals.